“How to Get Clean Energy” is a free public education workshop about solar electricity and level two electric vehicle charging presented by Northwest Electric and Solar. 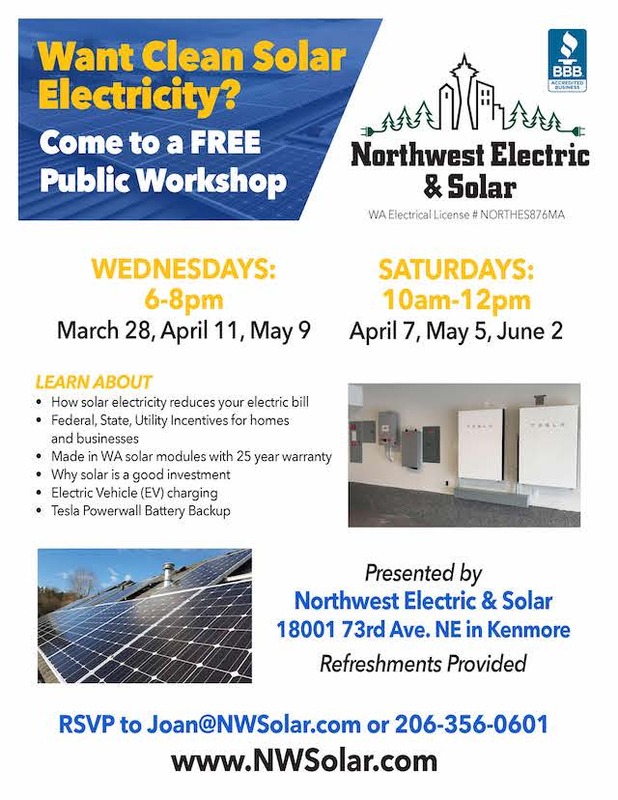 Workshops will be held at the new Kenmore location of Northwest Electric and Solar at 18001 73rd Ave NE in Kenmore where there is visible rooftop solar and free EV charging. Workshop will cover how solar electricity works; about the federal, state and utility incentives; Made in WA solar panels; what is needed for electric vehicle level two charging at home or office; and battery backup power. Refreshments served. For details contact Joan@NWSolar.com or 206-356-0601.